Fishing is occurring at an unsustainable rate. Technological advances, political indecisiveness, and commercial interests in the fishing industry have produced a culture where fish stocks are being exploited beyond their capacity to regenerate. Commercial fish may become extinct within our lifetimes. Official figures of global fish stocks have been wrong for several years. The United Nations Food and Agricultural Organization reported that the amount of wild fish caught had increased from 44 million tons in 1950, to 88 million tons in 1990, to 104 million tons in 2000. These figures were official even though the FAO knew they were false, that the catch was actually decreasing. In 1997, the Grand Banks cod fisheries of Newfoundland, Canada, had collapsed. 75% of all fisheries were either fully exploited or overfished. Critically endangered species of fish are still allowed to be fished. For example, the bluefin tuna’s stock is equivalent to the black rhino. However, it is still being illegally caught and sold. Furthermore, there is even an oversupply problem in the current market as technological innovations have allowed entire schools of bluefin tuna to be caught at the same time. In Spain, the catch of bluefish tuna has exponentially decreased: 5000 million tons in 1999, 2000 million tons in 2000, 900 million tons in 2005. Developed countries are exploiting the fishing stocks of developing countries. In West Africa, fishing agreements are made with European, American, and Asian fleets because money is needed to build basic infrastructure like schools and hospitals. This comes at the expense of their own local fishing industry which operates at a much less industrialised level, even though much of their local economy is sustained by fisheries. Widespread corruption within developing countries allows many agreements to be flaunted. The most common technique for modern fishing, trawling, is severely damaging. A fishing vessel goes to sea, placing a net 8 inches into the seabed. The vessel travels over a certain distance where everything in the net is taken, without discrimination, and hopefully some commercially viable fish is in the net. Much of the commercially unviable fish is thrown away, with incalculable damage done to the ecosystem. Han Lindeboom compared fisheries to other industries for bottom-dwelling animals. Fishing is a thousand times more damaging than sand or gravel extraction, a million times higher than oil or gas exploration. Technological advances used for the fishing industry are comparable to that of modern warfare. Systems of satellite technology such as Global Positioning System are used near the surface of the water and sonars with advanced echolocation are used under the water. Boats have improved engines, nets, and lines. Computers can plot fish underwater, specify its quantity, and map it with a three-dimensional image. Deep sea fishing is becoming more accessible with technological advances and more attractive as global fish stocks decline. Most commercial fish come from the shallow seas of the continental shelves or the surface water of the open oceans. Deep sea fishing involves the fish below 1 000 feet. However, regulation of the deep sea within each country’s 200 mile limit is in its infancy, and it is non-existent elsewhere. One deep-sea fish, blue whiting, has a sustainable catch of 1 000 000 tons a year. Norway alone catches 880 000 tons a year. There is a history of fishery mismanagement ever since the industrial revolution. Industrial fishing began during the late 1800s where steam-powered trawlers operated in Western Europe. Local fisherman noticed that fish populations were being systematically wiped out. Half the fishing fleet in the world was sunk in WW2 and the opportunity to manage fisheries then was lost. Afterwards, scientific and mathematical models were developed to better understand fish. However, these were not taken seriously. For example, maximum sustainable yield, the optimal point between sustainable population size and the fishing intensity, is currently discredited because of the inability to accurately measure fish quantities. However, it is still the objective of several international fishing conventions. Newfoundland, Canada, is a prime example of what happens when a community dependent on fisheries has overfished their fish stocks. Europeans have settled and fished in Newfoundland for 500 years, since John Cabot arrived in 1497. Estimates of the spawning stock of cod are 4.4 million tons at the time of Cabbot. In 1992, the fishing industry closed because the cod was at the point of extinction. Now, shrimp and snowcrabs have settled in the waters. This is also a cultural problem as the fisherman that live in that area work in the fisheries for 12 weeks a year then collect unemployment insurance for the rest of the year. The common oceans, parts of the water that are beyond each country’s 200-mile limit, are not being managed properly. Stinting is the favoured method of management around those areas, where each vessel catches a limited amount of fish. However, it does not seem to work, as two species of large toothfish around Antarctica have gone extinct. The vessel construction industry is pushing more vessels to fish in those unregulated areas as fish stocks decrease. For example, the Irish domestic pelagic fleet is already 40% larger than the EU fleet limits. Yet, new fishing vessels, such as the Atlantic Dawn with over 15 000 tons, are being produced because of the entrenched interests business and political interests. Crimes of omission are a cause in overfishing. People turn a blind eye to this situation. Logbooks do not report true catches. And even if vessels are caught, the fines for vessels that overfish are often not enforced. ‘Black fish’ is the name given to illegal catches. According to the International Council for the Exploration of the Sea, 50% of hake is illegal, 60% of cod is illegal. The observation of independent observers on fishing vessels that operate illegally are not made public without great censorship, for fear of causing offence. High end restaurants are serving endangered fish as a delicacy for the wealthy. Celebrity chefs maintain those several restaurants and publish numerous cookbooks on serving endangered fish. The example of Nobu is used, one of the most famous restaurants in the world. Canned tuna is readily available to the general public. However, most canned tuna is fished unsustainably. The first problem is the bycatch. Purse seining up to 80 miles long sweep the oceans for tuna, but catching everything else in the way, including sharks, dolphins, and a variety of other fish. Second, little is being done to restrict the tuna fleet. Second, the stock is not managed because it is being operated in the middle of the ocean. Even a scientific discussion about extinctions is marred by political interests. The United Nations Food and Agricultural Organization currently warns that 75% of the world’s fisheries are fully exploited, overexploited, or significantly depleted. One practical solution to overfishing is maintaining ecological and economic operations in offshore water, and ecological and cultural operations in the inshore waters. Rights-based systems of are a viable solution to managing fish. Quotas can be bought or sold such that fisherman have incentive to save up for the future. Furthermore, fisheries have incentive to watch their neighbours, in case their fish stock declines and the value of their quotas falls. Iceland currently uses this system and their waters are among the few places in the world where fish is both plentiful and on the increase. Marine Reserves are another viable method of protecting fish. In order for intensive fishing to occur, 50% of the ocean must be protected so that marine life can be sustained. However, marine reserves are not just an environmental solution, it a cultural entity that can also be used to generate economic revenue. In the Great Island Marine Reserve of New Zealand, 1370 acres of water are protected. The largest snappers are 8 times larger than those outside and 14 times more numerous. Recreational fishing must be better managed along with industrial fishing. The contemporary angler is equipped with technology such as sonars, fish finders, and global positioning systems. As a consequence, they are taking more fish. Although angers are more cautious than industrial fisherman, the amount of fish they take is growing. The Marine Stewardship Council is an agency that gives an independent certification of sustainability to fisheries. It has three stringent criteria: the fishery must not be overfishing, the fishery must maintain the ecosystem of the fish, the fishery must be operating in accordance with local, national, and international law. Remarkably, all filets that McDonalds use are MSC certified, with more large stores to follow. Fish farming is the process of growing fish in an artificial environment. The traditional method involves feeding fish waste vegetables, and this is being done in developing countries. Modern fish farming involves feeding processed small wild fish to large carnivorous fish such as salmon, trout, and prawns. However, modern fish farming often relies on fish taken from the water in the developing world to feed the fish being sold in the developing world. Furthermore, fish farms introduce alien species are to local environments. The situation with the fish in the oceans is dire. The problem of overfishing are as follows: the catches of wild fish have peaked and are now in decline, rational fishery management is the exception rather than the rule, the most valuable fish is trawled to the point of extinction, the developed world is stealing from both the developing world and the future generations, and fish farming, the most viable alternative to aquaculture, has serious issues. Solutions that people can do: fish less today so we can harvest more fish in the future, eat less fish that is wastefully caught, become educated about fish so that we can reject fish caught unsustainably, and favour the most selective, least wasteful fishing methods. Laws that should be implemented in the future: give fisherman tradable rights to fish, create marine reserves, give regional fisheries bodies real power as they are preserving the populations in their local area, and let citizens take ownership of the sea. University of British Columbia Professor of Fisheries Daniel Pauly, reviewing the book for the Times Higher Education Supplement, praised the book: "It is entertaining, outrageous and a must-read for anyone who cares about the sea and its denizens, or even about our supply of seafood." The British newspaper The Independent called it "persuasive and desperately disturbing," "the maritime equivalent of Silent Spring...". Although widely reviewed in the United Kingdom, the book received little attention in the United States. However, it was featured on the cover of National Geographic Magazine. The book was made into a documentary film of the same name in 2009. The film examines the threatening extinction of the bluefin tuna, caused by increasing demand for sushi; the impact on populations, marine life and climate resulting from an imbalance in marine populations; and the starvation and hunger in coastal populations, caused by the possible extinction of fish in some waters, the possible loss of livelihoods as experienced in Newfoundland following the collapse of the cod population, along with the potential remedies. It premiered at the Sundance Film Festival in the World Cinema Documentary Competition in Park City, Utah, 15–25 January 2009. on 7 December 2009 at 10 pm ET/PT on CBC News Network's The Passionate Eye. The powerful documentary was filmed over 2 years at locations in England, Alaska Hong, Senegal, Tokyo, Hong Kong, Nova Scotia, Malta and the Bahamas, following author, Charles Clover while he investigates those responsible for the dwindling marine population. The film features Clover, along with tuna farmer turned whistle blower Roberto Mielgo, top scientists from around the world, indigenous fishermen and fisheries enforcement officials, who predict that seafood could potentially extinct in 2048. Labelled the Biggest Problem you've Never Heard of, The End of the Line illustrates the disastrous effects of overfishing, and rebukes myths of farmed fish as a solution. The film advocates consumer responsibility to purchase sustainable seafood, pleas with politicians and fishermen to acknowledge the chilling devastation of overfishing, and for no-take zones in the sea to protect marine life. On 3 March 2010, REACT to FILM screened End of the Line at the SoHo House in Manhattan, NY and moderated a Q&A with producer Alexis Zoullas. Celebrity chef Jamie Oliver and Japanese restaurant chain Nobu have come under criticism for not taking tuna off the menu. The Economist has called The End of the Line "the inconvenient truth about the impact of overfishing on the world's oceans". The film was directed by Rupert Murray, Executive Produced by Christopher Hird and Chris Gorell Barnes produced by George Duffield and Claire Lewis, and narrated by Ted Danson. A French version was narrated by actress Mélanie Laurent and was released in June 2012 by LUG Cinéma. 1 2 Barnett, Judith B. "Book Review: The End of the Line: How Overfishing Is Changing the World and What We Eat." Library Journal. 1 December 2006. 1 2 Fromartz, Samuel. "The End of the Line." Salon.com June 20, 2007. 1 2 "The End of the Line: How Overfishing Is Changing the World and What We Eat." Science News. 23 December 2006. ↑ Pauly, Daniel. 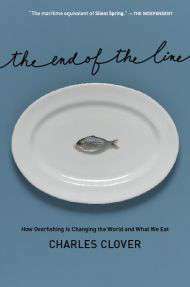 "Review of 'The End of the Line: How Overfishing Is Changing the World and What We Eat'." The Times Higher Education Supplement. 22 April 2005. ↑ Hirst, Christopher; Patterson, Christina; and Tonkin, Boyd. "Paperbacks." The Independent. 25 February 2005. ↑ Jansen, Bart. "Fishing for Answer to Hard Questions." Maine Sunday Telegram. 25 March 2007. ↑ Daunt, Tina. "'The End of the Line' Examines the Perils of Overfishing." Los Angeles Times. June 12, 2009; "Underwater Treasures." The Economist. January 22, 2009. ↑ Davis, Peter. "React to film". Vogue Italia. Retrieved 17 February 2012.